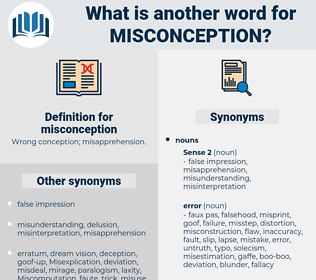 What is another word for misconception? Abilities, miscalculation, misrepresentation, miscommunication, misinformation, false, ambiguity, misstatement, miscarriage, blunder, fake. 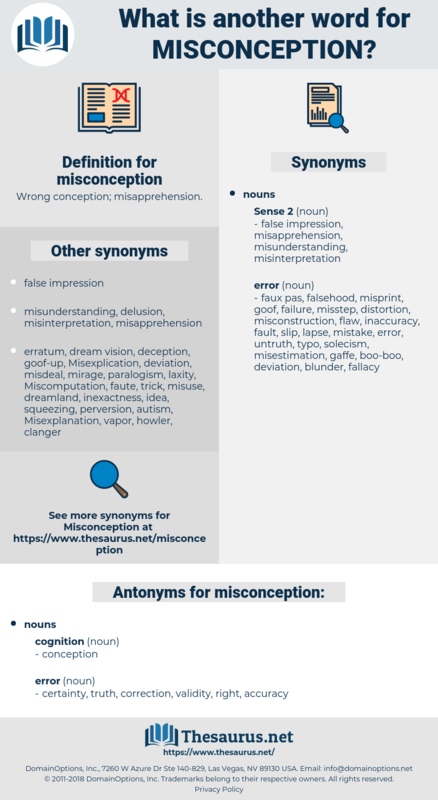 misapprehension, misunderstanding, misinterpretation, mistake, fallacy, illusion, confusion, error, mix-up. certainty, truth, correction, validity, right, accuracy. But here, to save falling into a misconception, it is necessary to point out that I do not say the same opportunities, but equal. He stated that he wished to point out that there had been a serious misconception on the part of the French Government as to the character of the proposal of the British Government. fallacy, erroneous belief, delusion, misapprehension, fancy, phantasy, unsoundness, fantasy, false belief, self-deception, misunderstanding, hallucination, illusion, mistake, mirage, self-deceit, error.